In October 1914, 28 explorers set out from Buenos Aires to make the first transcontinental trek across Antarctica. By January, their ship, the Endurance, was mired in ice, unable to reach the continent, and the next November, it sank. Led by British explorer Ernest Shackleton, the crew lived on ice floes, eventually setting out on lifeboats for solid ground in what would become one of the great tales of human survival. All 28 of the Endurance’s crew survived. So did more than 90 fragile negatives of images taken by the expedition photographer, Frank Hurley. The newly digitized photographs from the 1914-1917 expedition, on display at the Royal Geographic Society in London through February, document the harrowing multi-year journey. While the Endurance survived, trapped within the ice, Hurley set up a darkroom in the ship’s refrigerator. His images show not only the extreme circumstances, but the day-to-day work and play that went on inside the ship during its long, isolated months of entrapment, much of which took place during the dark Antarctic winter. They scrubbed the ship, took down what scientific observations they could, and played chess. 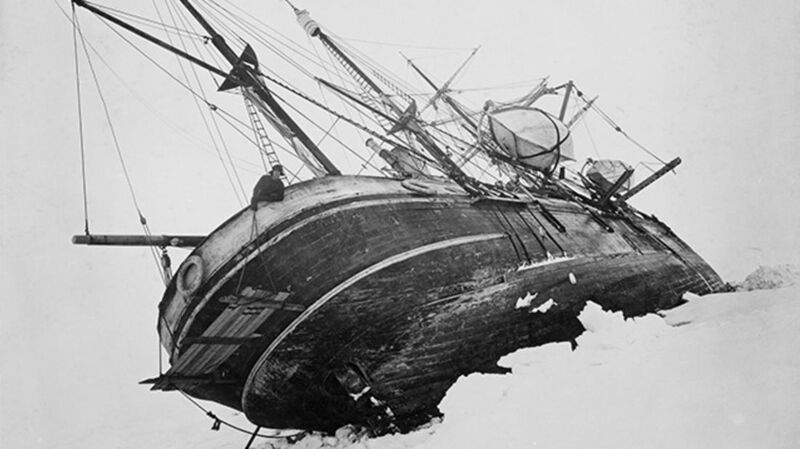 Later, when the ship keeled over and then sank, they set up camp on the ice. In early April 1916, the ice floe they were living on split, and they set out in lifeboats for solid ground. After a perilous crossing, they reached the cold and inhospitable Elephant Island, the first land the crew had stood on since 1914. A handful of men then set out for whaling stations on the island of South Georgia, while the rest of the crew (including Hurley) stayed behind, living underneath two overturned lifeboats. After about four months marooned on Elephant Island, those 22 men were finally saved by Shackleton, who secured two ships to rescue them and take them to Chile. More of Hurley's incredible visual record of the journey is on display in Enduring Eye: The Antarctic Legacy of Sir Ernest Shackleton and Frank Hurley, on view at the Royal Geographic Society until February 28.